I have been slacking big time and I keep saying I’m back but life is crazy! SPOILER ALERT! 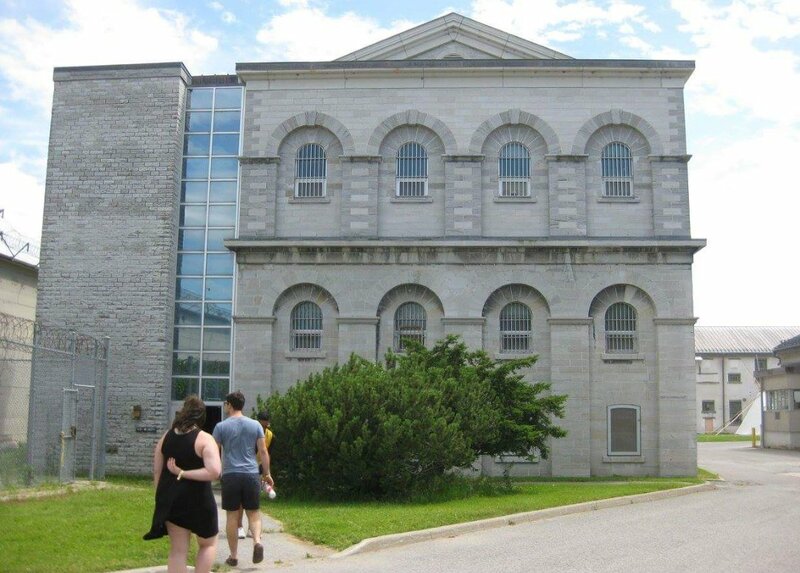 THIS POST CONTAINS PHOTOS AND DETAILS OF KINGSTON PENITENTIARY AND IT’S MUSEUM. IF YOU PLAN ON SEEING KINGSTON PENN AND DON’T WANT ANY DETAILS RUINED FOR YOURSELF STOP READING NOW! 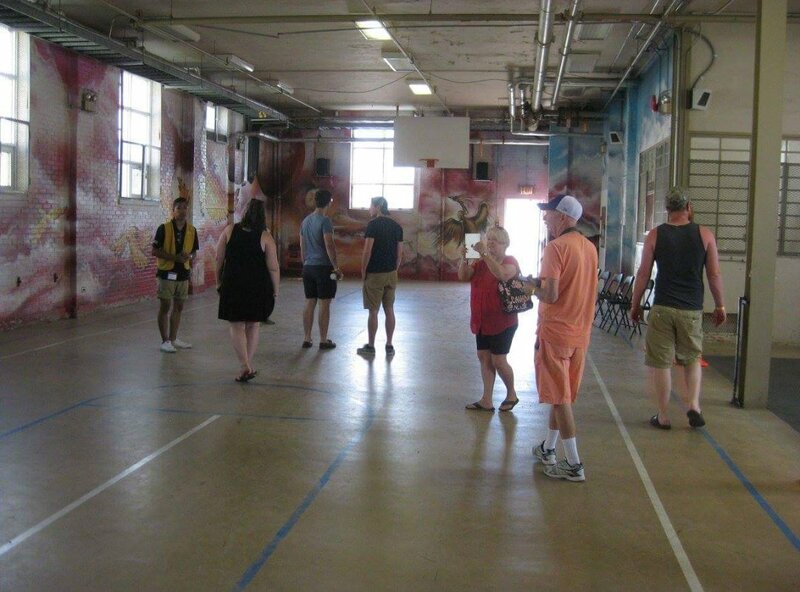 Welcome to part 3 of the Kingston Penitentiary Tours! This is the final post about Kingston Penn but I highly recommend that you go experience it yourself! 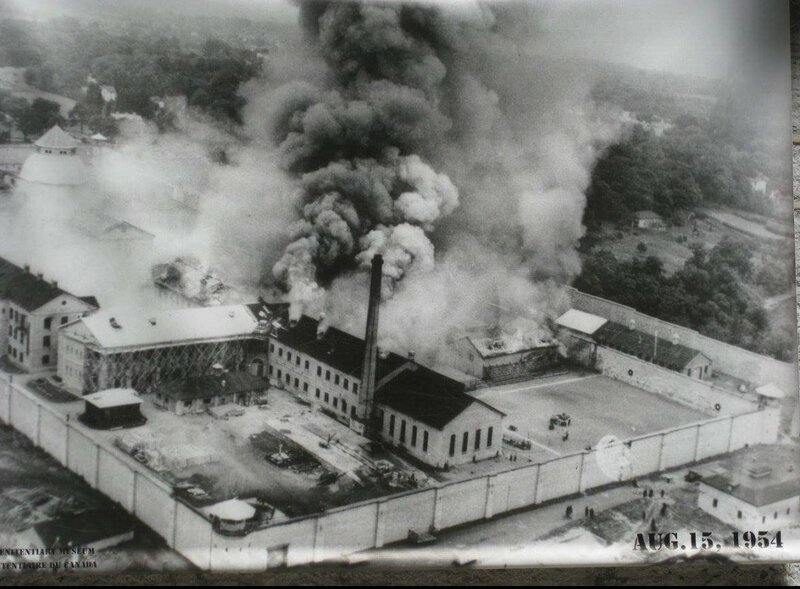 Back in part one I wrote about how they broke the bell during one of the three riots that happened at KP, this is a picture of the last and worst riot KP had. 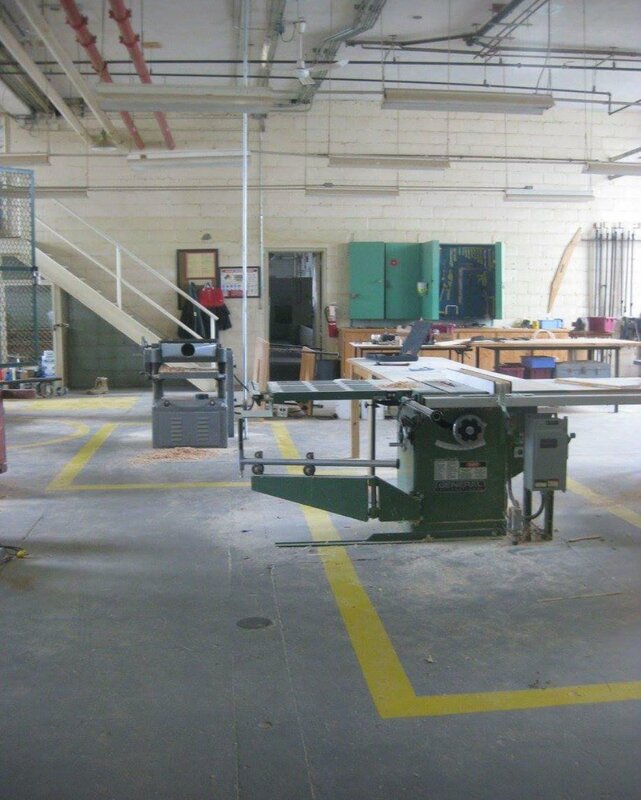 On the standard tour this is most of what you see for the workshops but on the premium you get to inside each one. 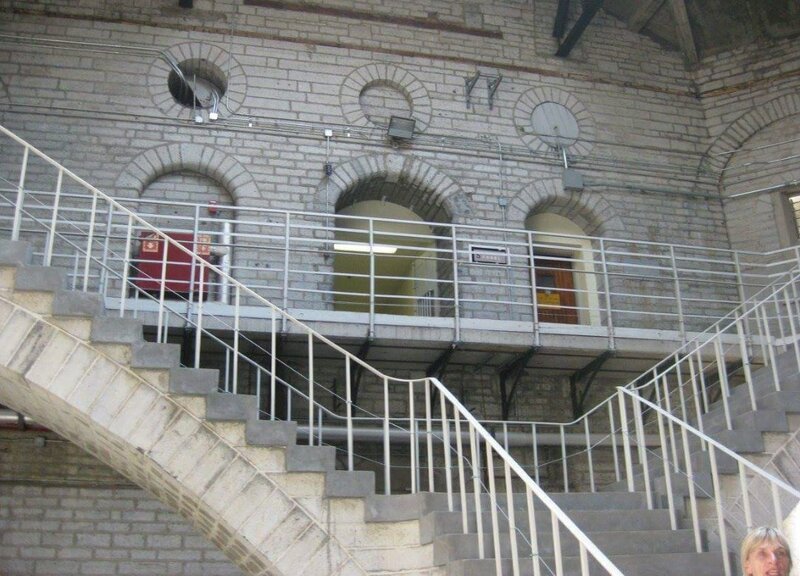 These stairs are amazing though, the workshops are really a work of art that these inmates built. All the workshops are emptied or else we wouldn’t be able to go in them for safety reasons but this one is my favourite because the ceiling is amazing. At one point they tried to cover it but it clearly didn’t stay. 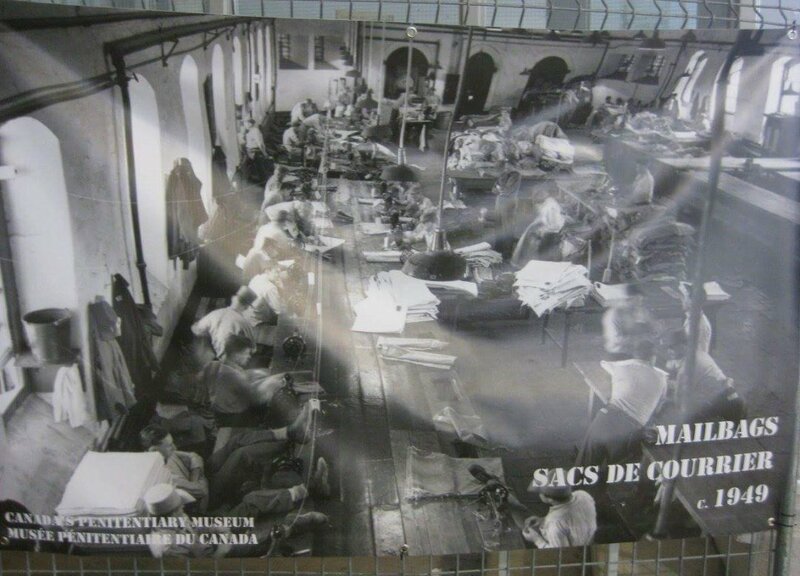 The mail bag workshop when it was in its prime. The workshops was home too many random things being made, for example, back when mailmen used those big bags full of mail – those we’re made at KP. If you went to an old highschool in Canada your locker was most made at KP. The weirdest thing they made at KP was locks; kind of ironic that inmates we’re making locks. This went on for awhile until someone questioned it and put it to a stop. The one shop that you couldn’t go in was the carpenter workshop and that was because it was still full but I liked it that way so you can actually see what it was like. 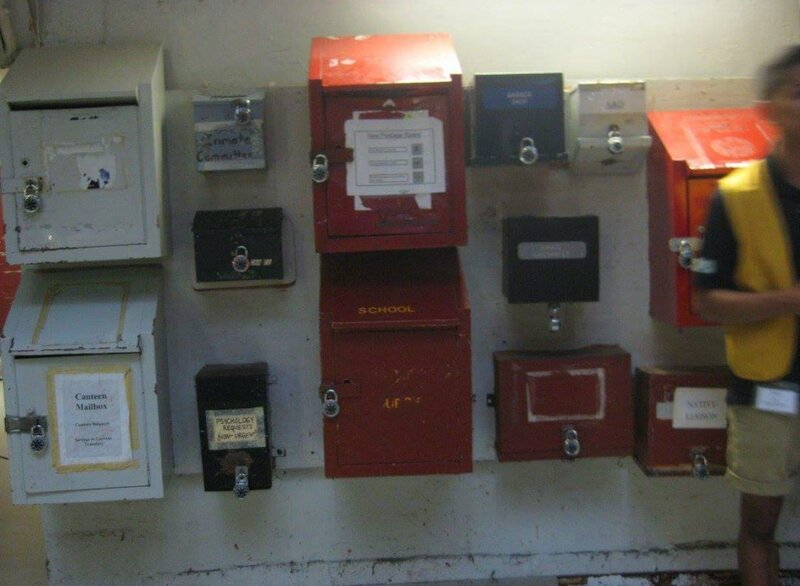 This is the mailing system at KP, you could request haircuts, hand in homework, and send complaints. 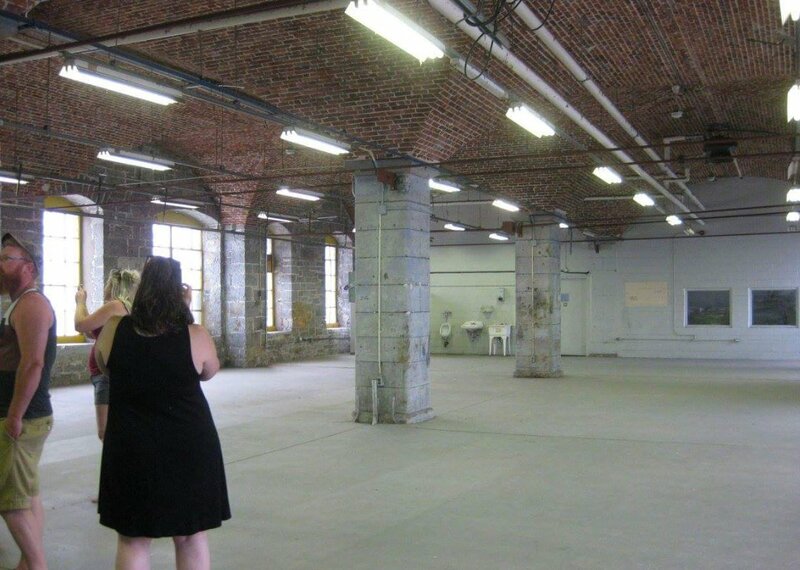 The cantine, where inmates can pick up supplies if needed. These mats would be all over the prison but they’ve taken then down and left them up in the gym. 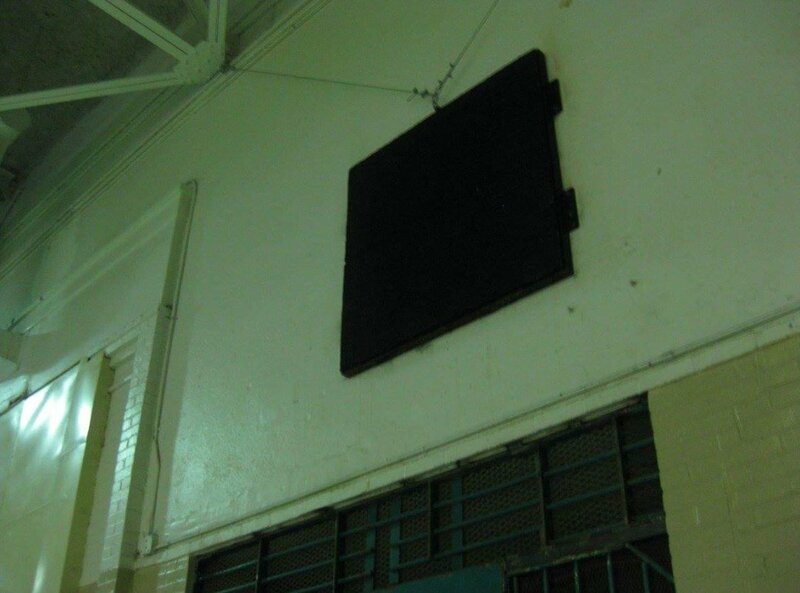 In prison you can’t shoot an inmate without shooting a warning shot first, so they would shoot at these mats so the bullet wouldn’t bounce all around the prison. The door to exit or enter. It’s thick and when it closes it slams which you could hear from far away. 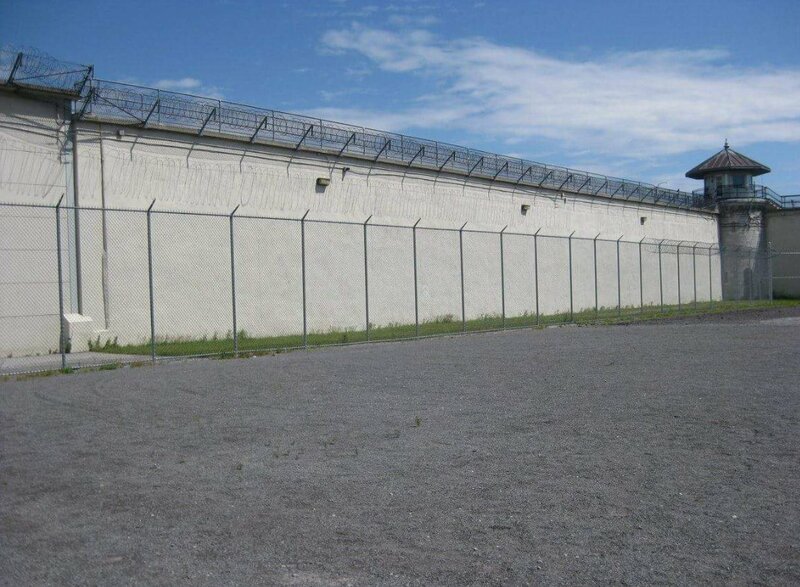 Sadly we have come to the end of our Kingston Penitentiary, this is the outside wall walking back to the parking lot. It’s a crazy experience and interesting place to be. 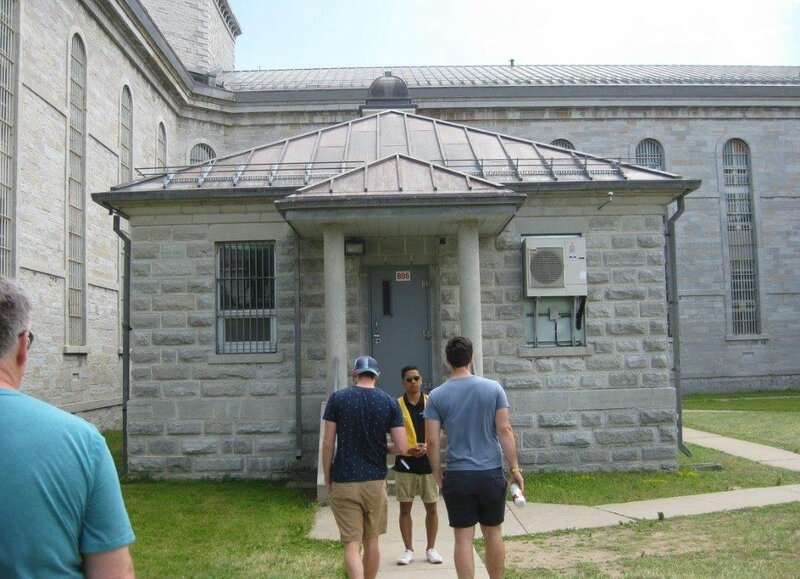 Welcome to part 2 of the Kingston Penitentiary Tour blog! 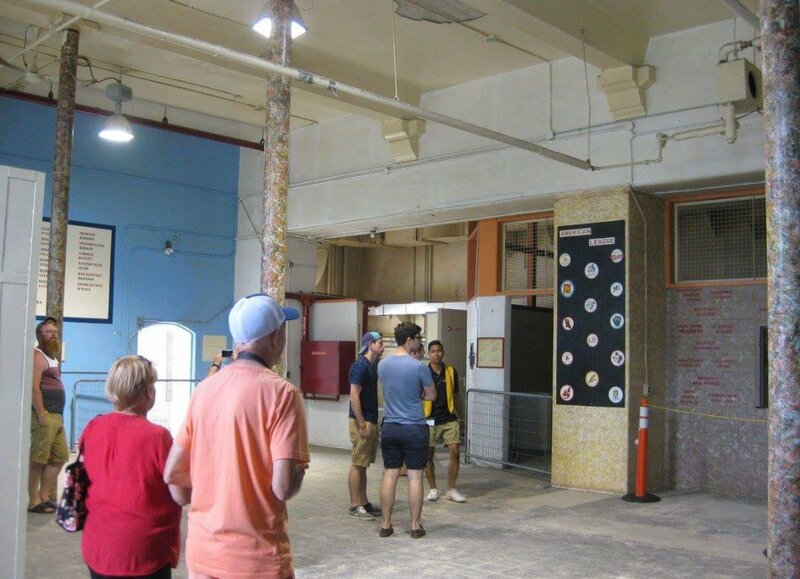 When you go to Kingston Penn there are actually two types of tours, your standard and your premium. Me being the lucky person I am and having a badass Mum and Step dad I saw the premium tour. When you turn into the parking lot this sign is posted. It really takes you back and sets the mood for what you’re about to experience. 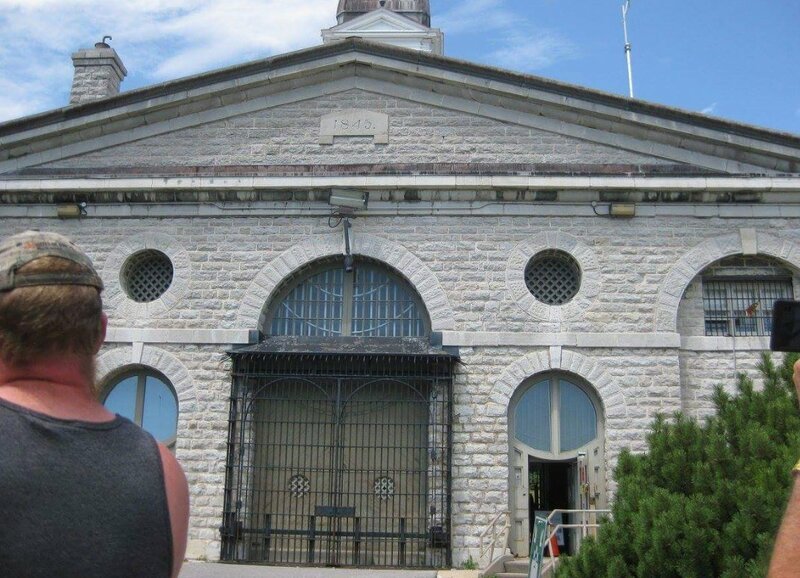 A lot of people asked my family and I why would you would want to go see a prison? The answer, because I want to experience prison without doing the crime to get into prison. 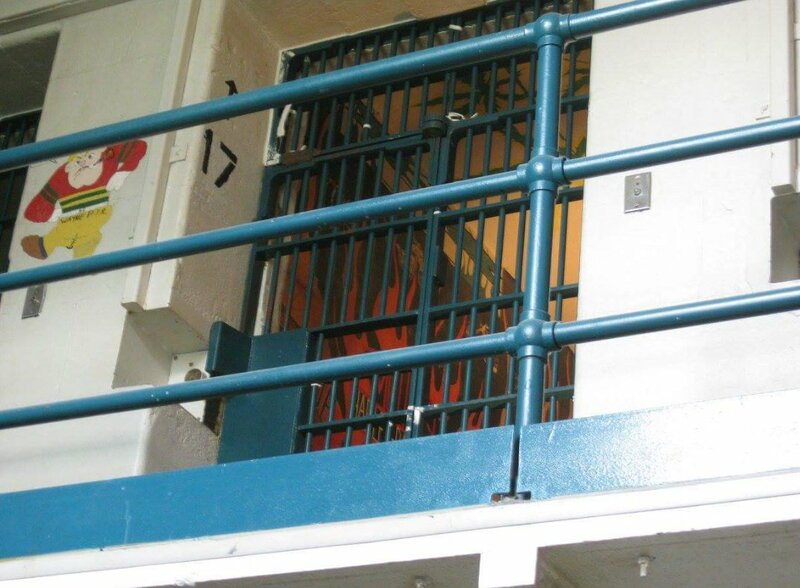 Above is the first locking door that visitors see. 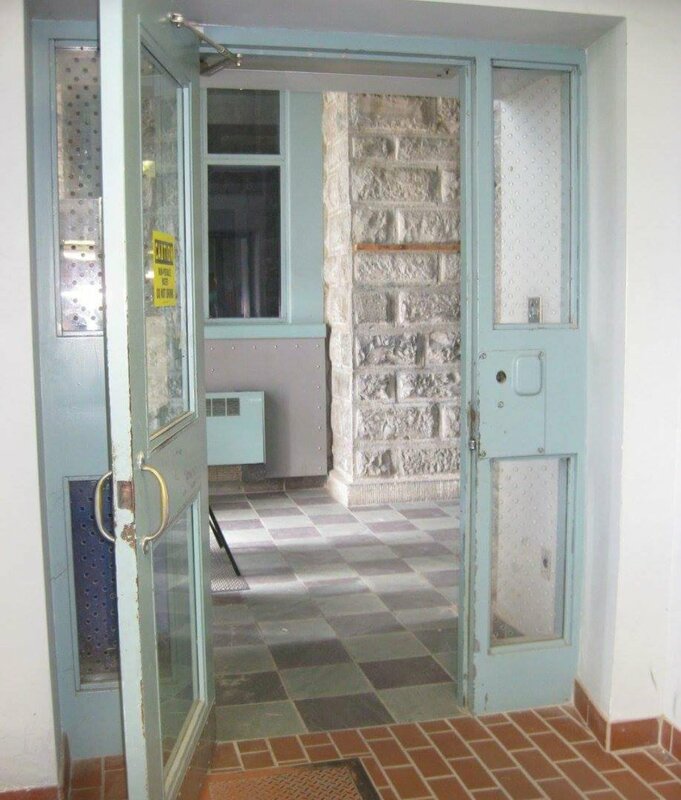 You’d think this would be way into the prison but it’s not, you walk past a tiny check in desk and turn a corner and this is the door you see. 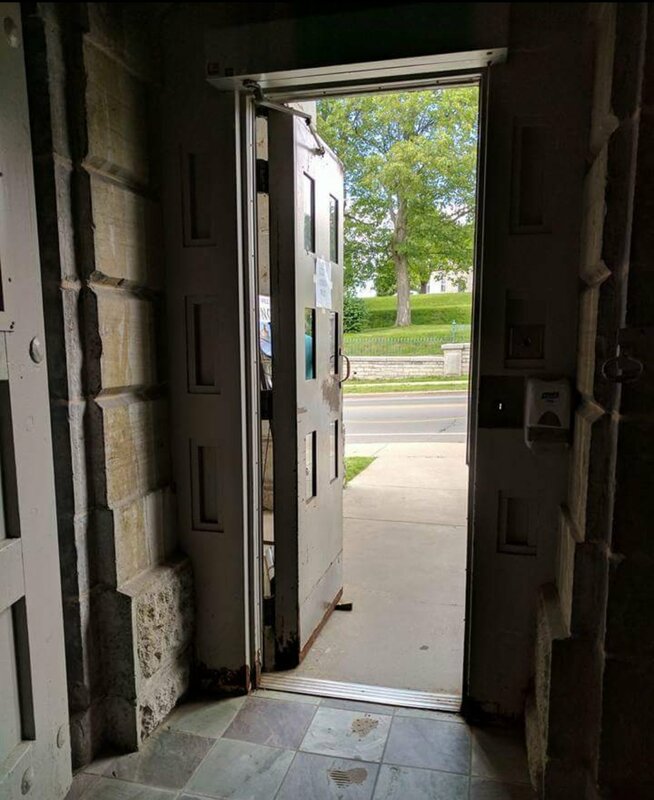 From then on, all the doors lock, but don’t worry they’re kept open for the tours. Above is the shoe outline where visitors had to stand while they got searched. Lets just take a moment and notice that one of the outlines are children size. 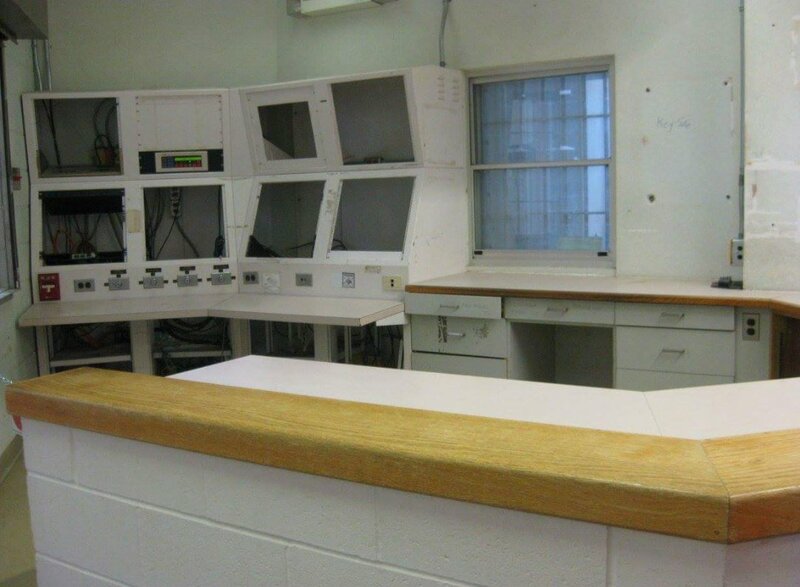 Above is simple to notice, is visiting tables for segregation inmates. You’ve seen it in movies but it’s crazy when you see it in person. The front gates from the inside. A guard actually died where we were standing, he came in with a truck but two inmates hid in his car and killed him. The Keepers House, that’s not the cool part of this photo though. Back in the day segregation was called the ‘hole’, the reason for that was because it was literally a hole in the ground, in pitch black. The hole for Kingston Penn is on either side of the sidewalk in this picture. To get to it, you go through the Keepers House. The Dome of general population. 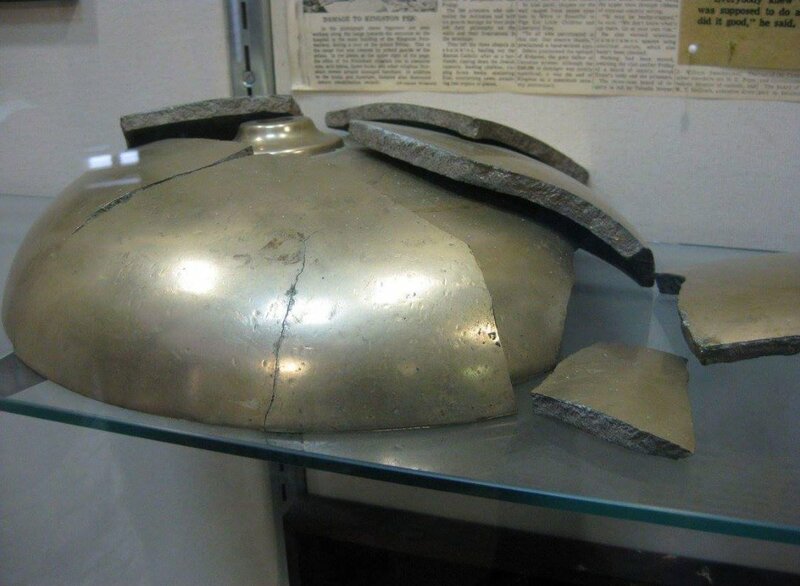 Remember that broken bell in part 1? It was in the center of this dome so it would echo throughout the prison. This dome is amazing, if and when you go stand in the middle of you can. When you’re there a old guard will talk to you about the dome and his experience which is amazing to hear. General population was one of the coolest parts because those are the cells you see in movies. You actually get to go in them, and sit in the stuff. 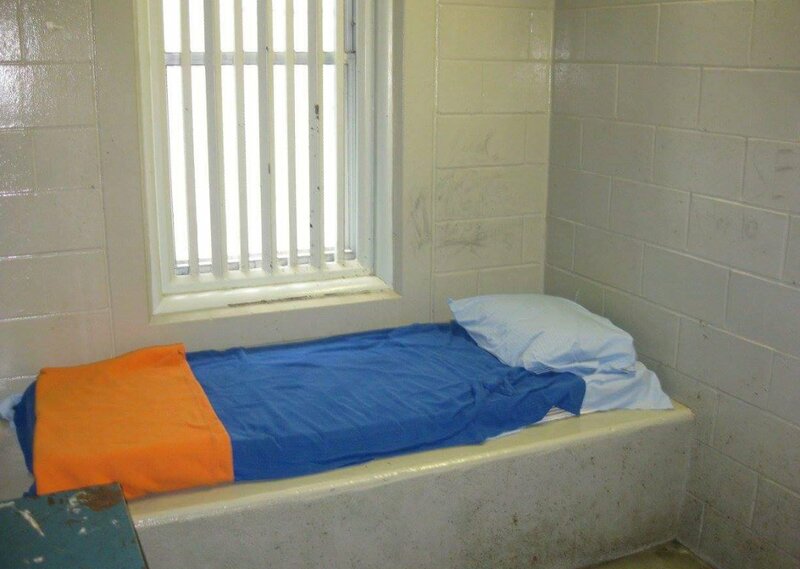 The things you see in the cell are actual belongs that inmates left behind when they got moved. Before Kingston Penn closed painting your cell would cost you $20, that’s two weeks worth of their pay. 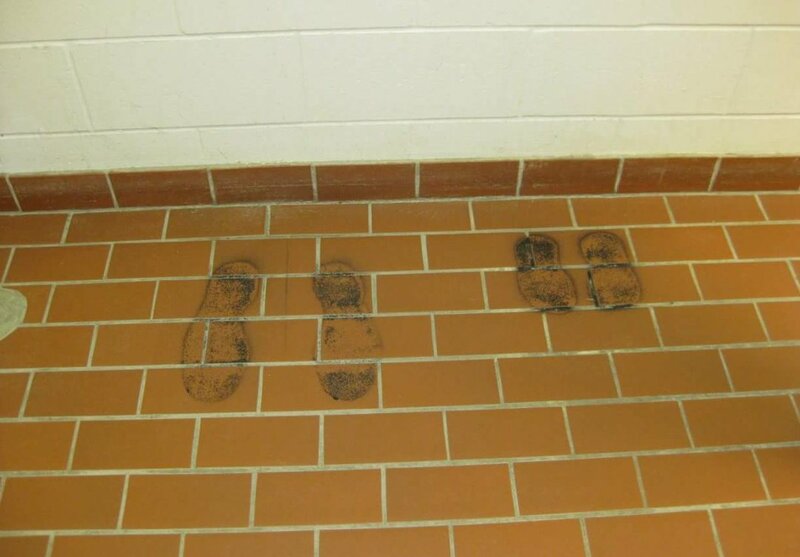 However, when the guards found out that KP was closing they told the inmates to leave their marks free of charge. During the tour I was leaning against this phone listening to my tour guide talk. 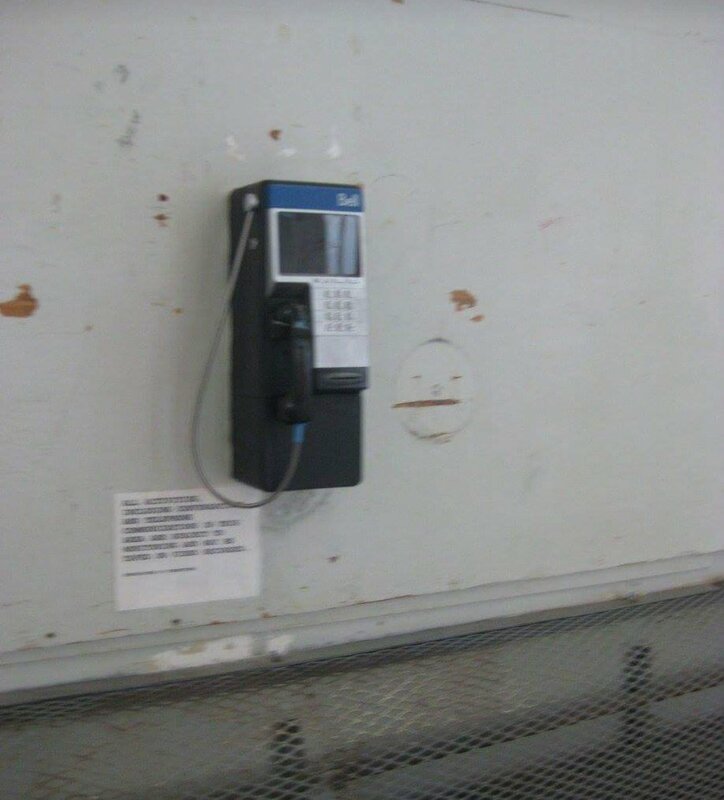 At one point he said there was only one murder that happened on this cell range and it happened at that phone. The story is there was one guy on the phone and another sitting at the table beside the phone. The guy at the table moved his chair which made that noise, the guy on the phone thought that was a sign for something so he killed him. 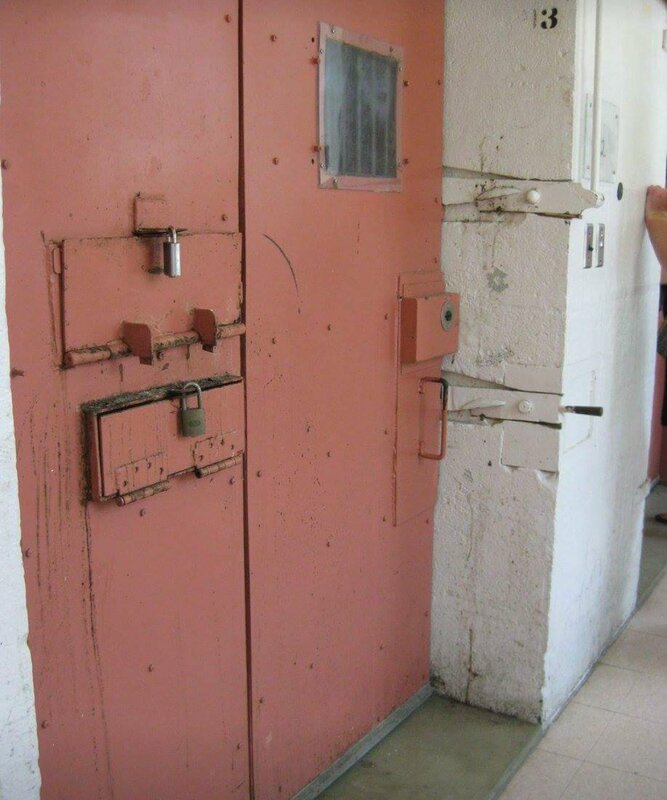 I was shocked when I saw a segregation cell, for some reason I thought they would be a shithole but it’s really not. They’re bigger, have storage, mirror, more space, a window and a room to yourself; only downfall you’re locked up 23 hours of the day. Segregation cell, who was in here? Alright let’s play a guessing game! 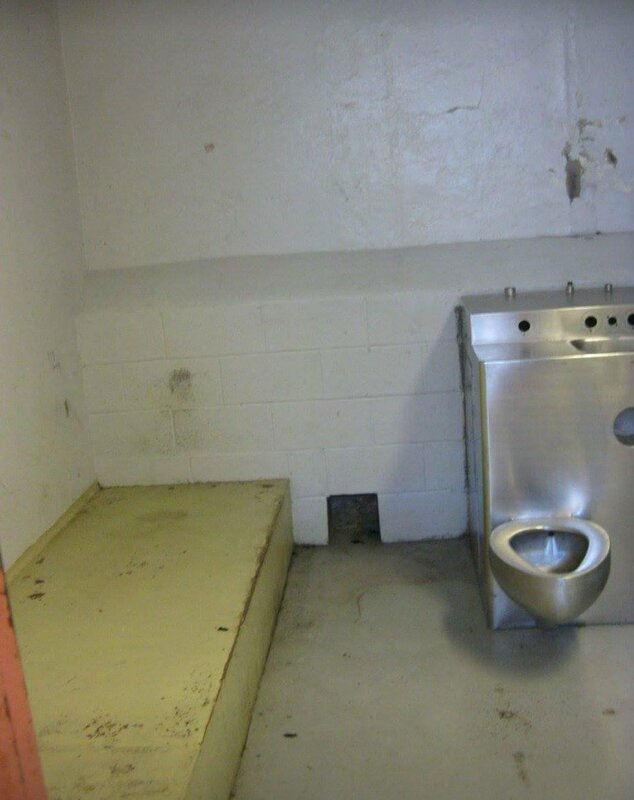 Who was in this cell? I’ll give you some clues: (1.) He’s Canadian. (2.) He’s a serial killer. (3.) He was married. (4.) He was declared a dangerous offered. If you’re Canadian this will be easy if not it may be harder. Now because I was on the premium tour we got to see a little bit more than the standard, obviously. The hospital was one of them, it was small and kinda creepy but I hate hospitals to begin with. 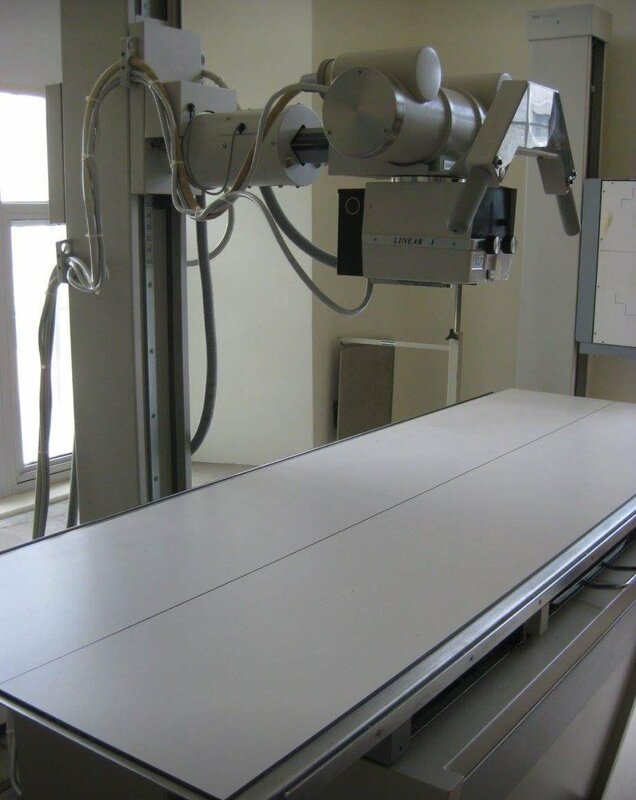 This was an old x-ray machine, in the corner there was an x-ray of an inmate. Pych Ward. Again this was part of the premium tour besides the gym. 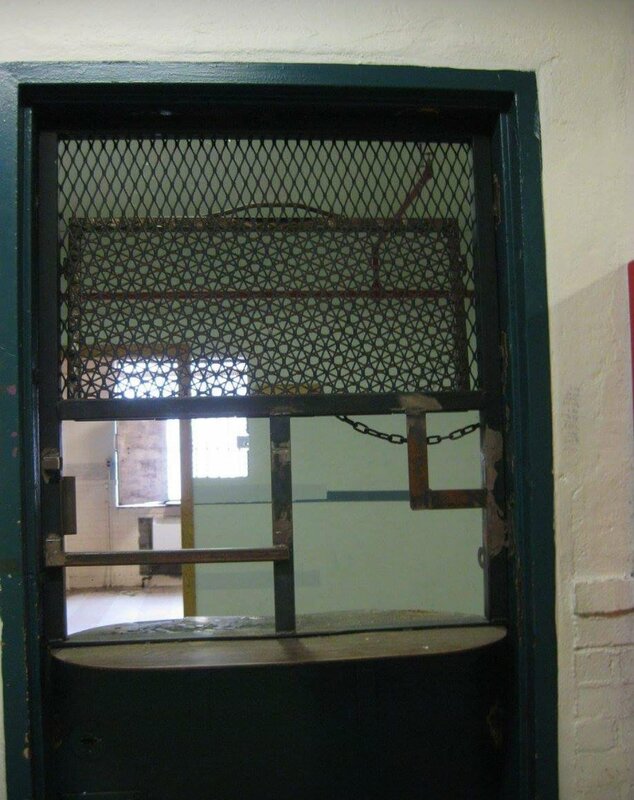 Door to cell, some were thick and some were just the bars. 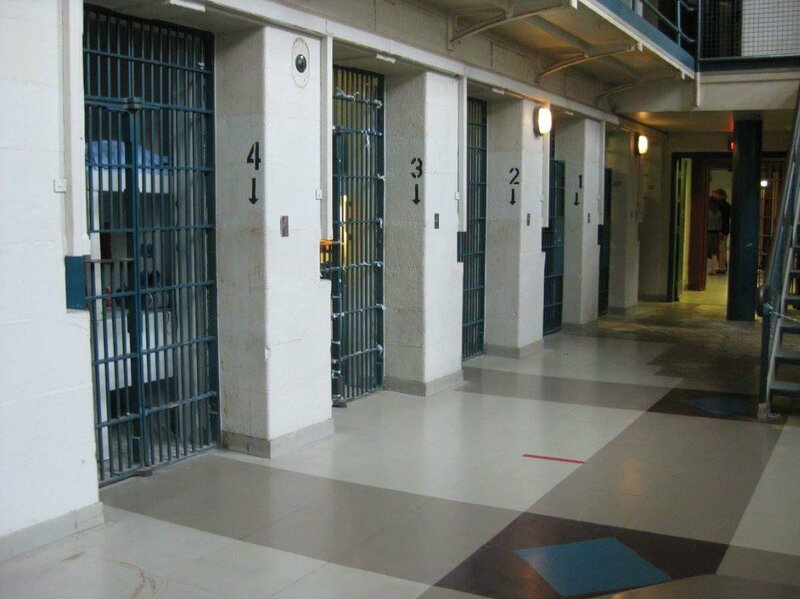 The inmates who got the thick ones were because they would through “gifts” at the guards, this prevented that. 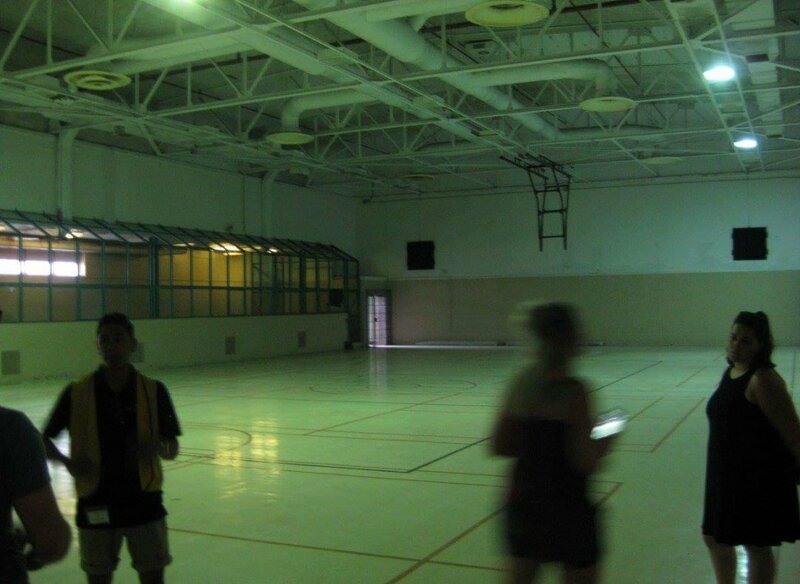 Our last picture for part two is the rec yard. 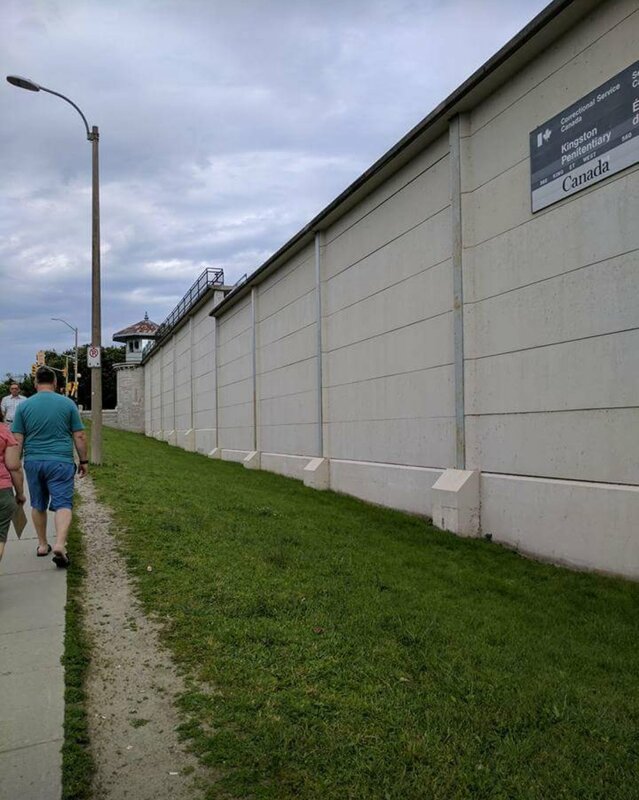 When you’re on the tour they tell you about how people use to escape over the wall back in the day, keep in mind back then the wall was made of wood and not that tall. I thought it would have been bigger since this prison was so big but I guess you forget they don’t have very many rights. It’s weird to think about how there is a beautiful lake on the other side of the wall. Stick around for part 3 coming soon! 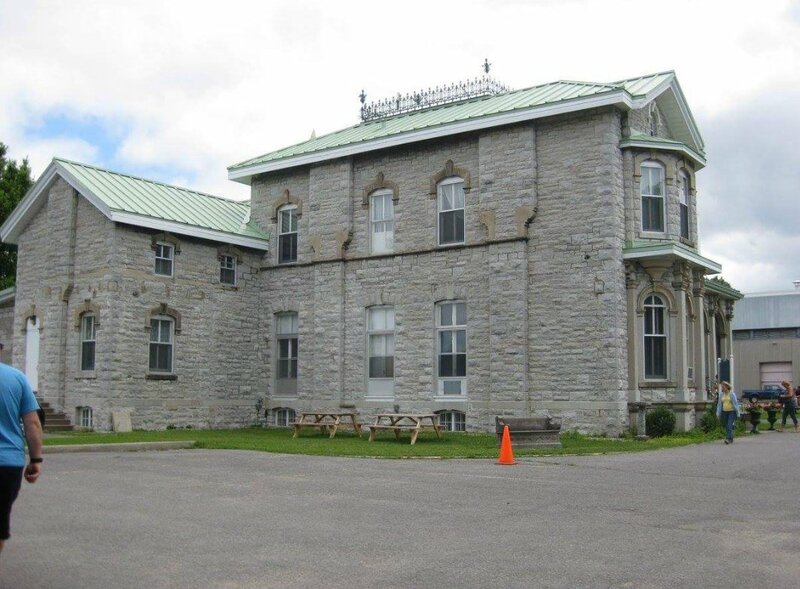 The Kingston Museum is located between Kingston Penitentiary and Kingston Prison for Women at the old warden’s house. This place is “free”, they ask for a donation to enter but it’s really up to you. There’s lovely workers at the front who tell you about it and after that you’re free to roam at your pleasure. The museum is literally just amazing things from the Penn. from the beginning to the end. 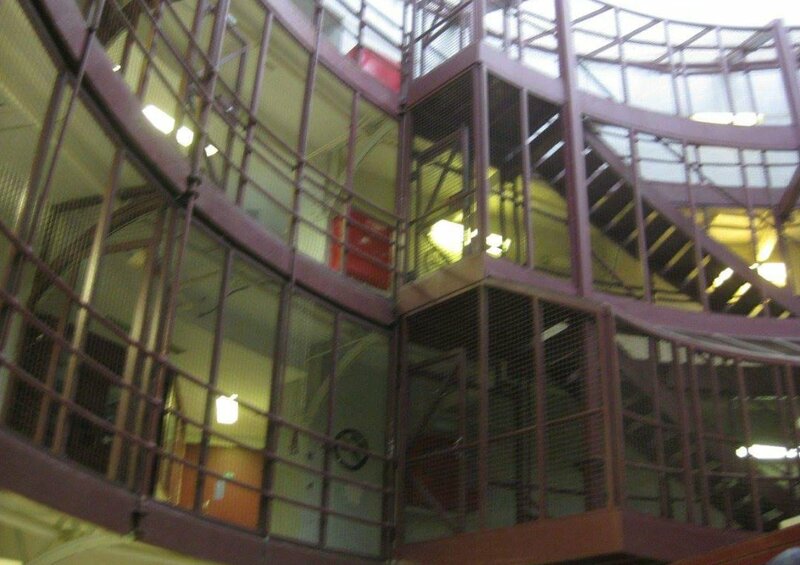 The bell (above) was the hub of the prison. This bell rang 100 times a day, it was the one thing that told you what to do, at what time of the day to do it. Now the Bell is broken, that’s because during one of the 3 riots they broke it and I don’t blame them. 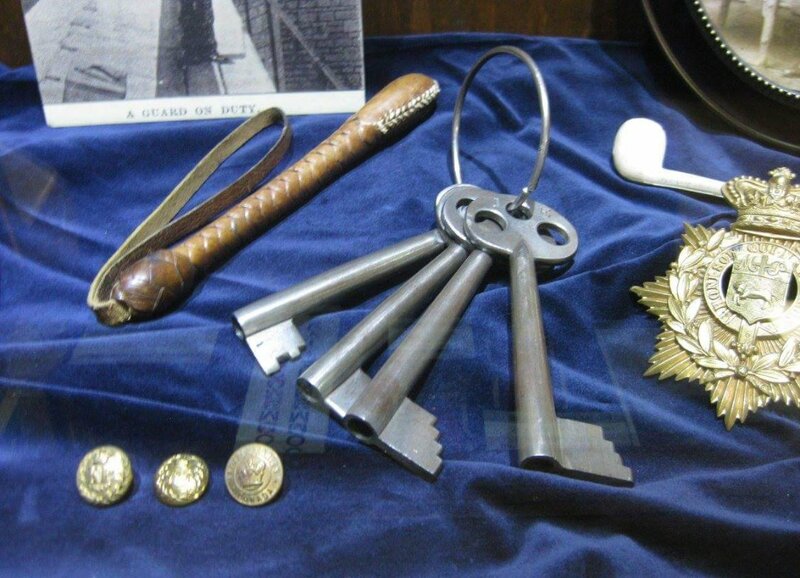 Above are old keys that the guards had to use to open and close all the doors until they updated the prison. These keys were massive and heavy, at some point in the museum there’s a small area where you get to turn one of the keys in a lock. It took some effort to do and it was loud. 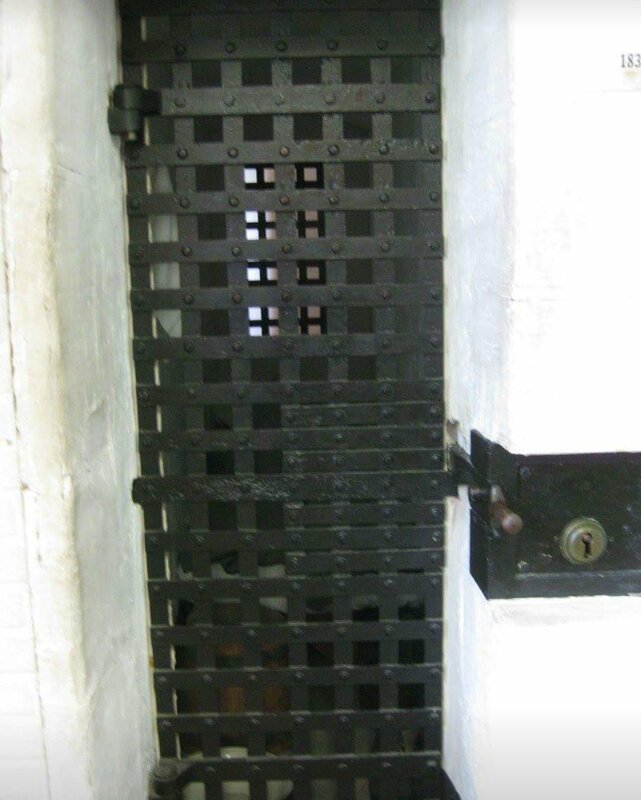 Above is an old cell back in the 1800’s. There was enough room for their beds, during the day they would lift their beds and lean it against the wall so they had “walking” room. 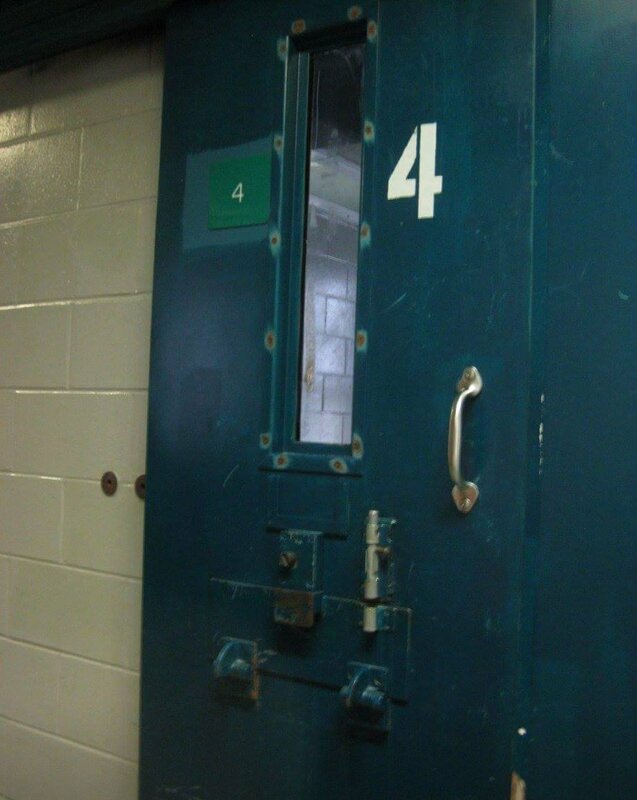 I’m 5′ 3 and your average size, I would have trouble fitting in this cell,I couldn’t imagine being in there. 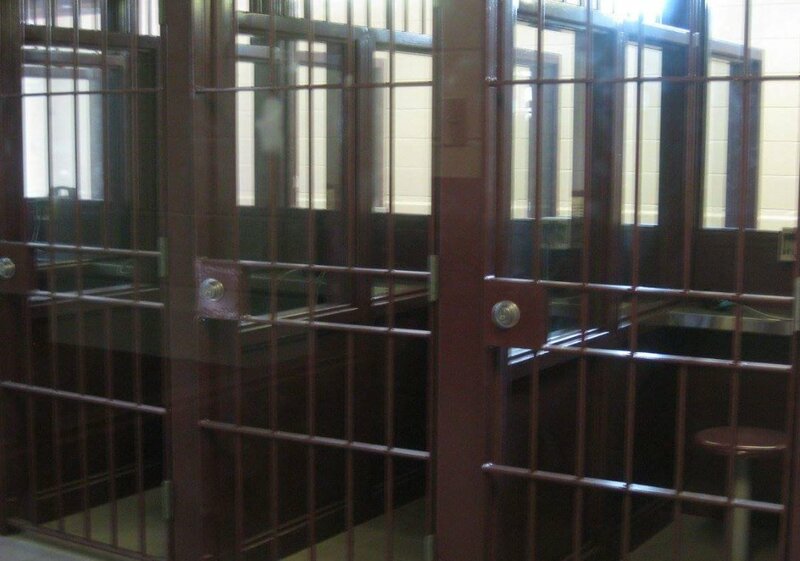 The cell you see now at the Penn are two of the old 1800 ones combined. 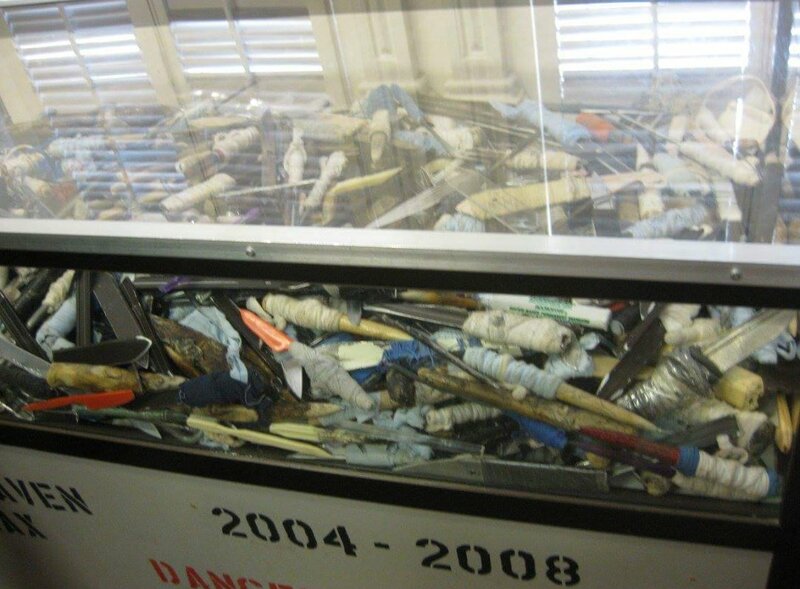 Above is a picture of shanks taken from Millhaven from 2004-2008. 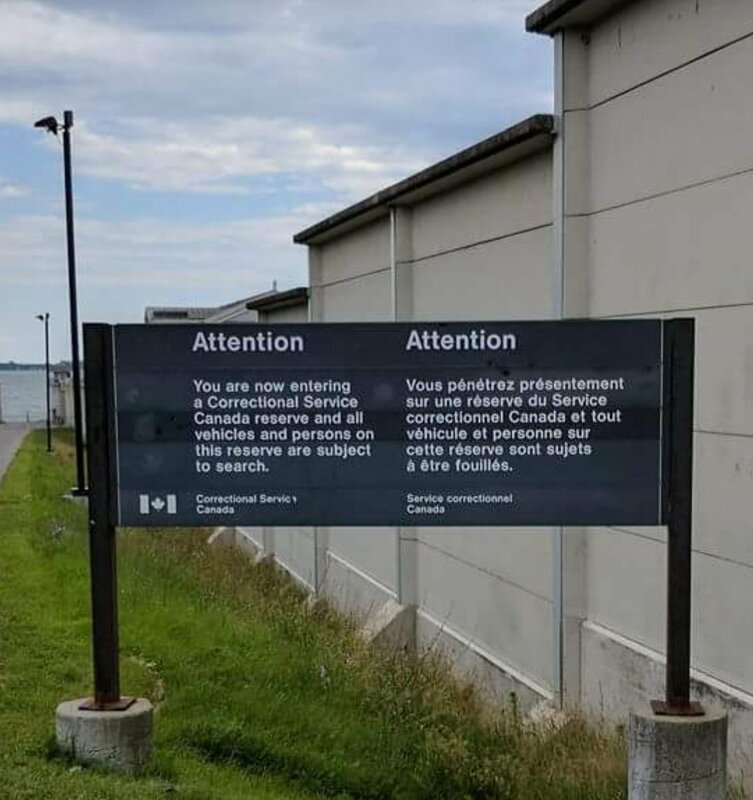 Millhaven is the prison that still runs in Kingston. It’s amazing to look at and see how they make them. 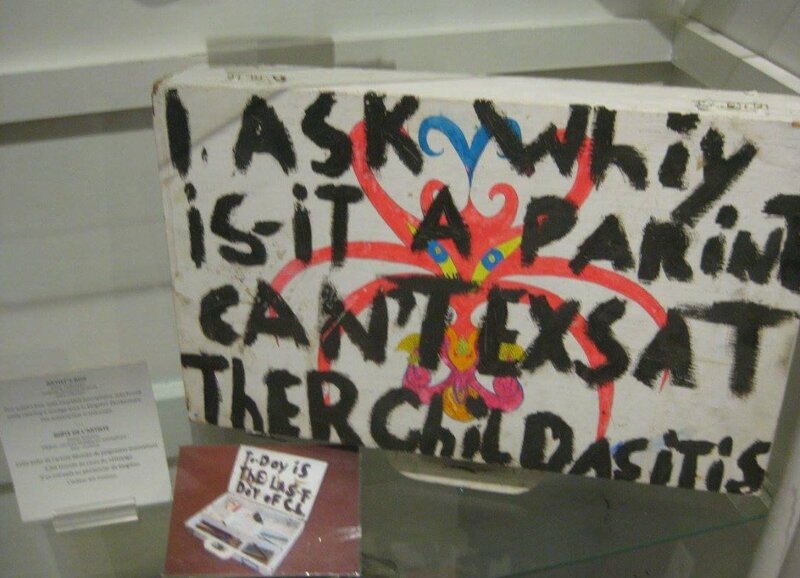 Above is art from an inmate, can you figure out what it says? There was a bunch of art which was amazing, there was some talent locked up. 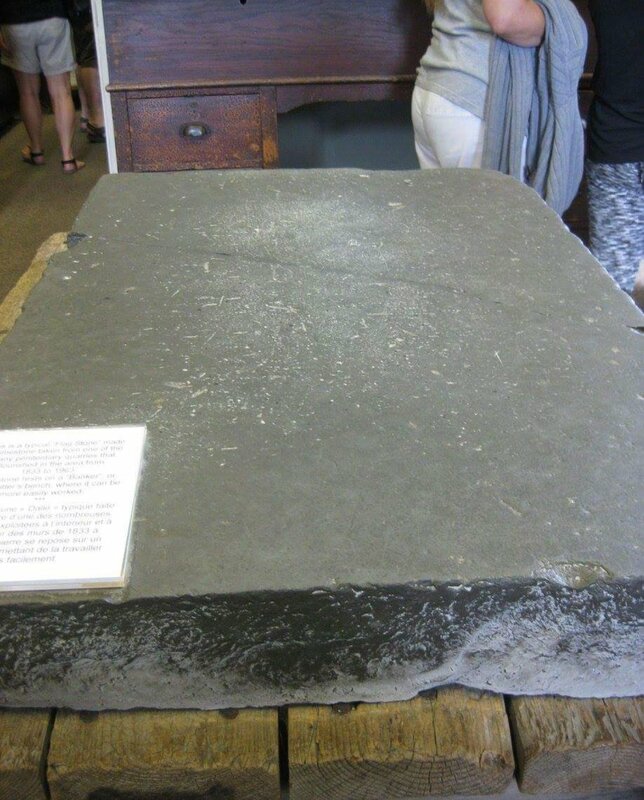 My finally picture for this post in the stone that the prison was made of. 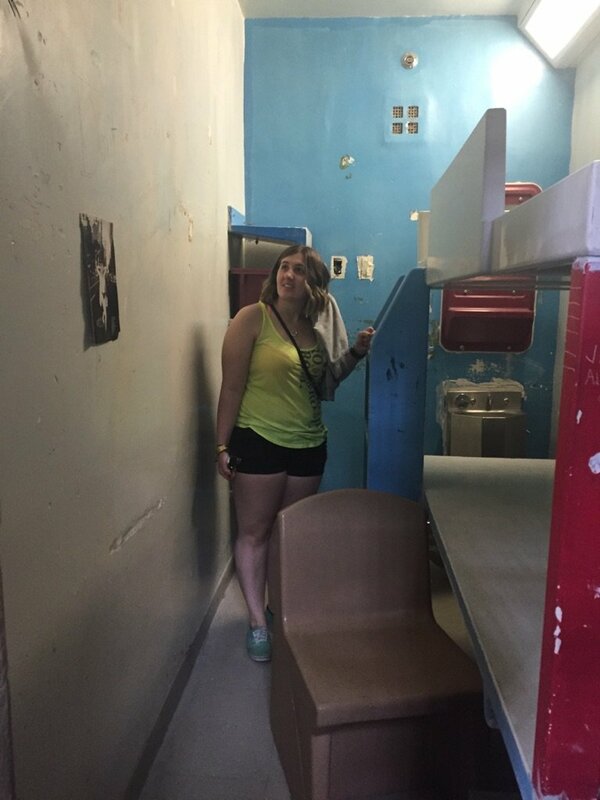 The inmates actually built the prison while they were serving their sentence. The work they did was amazing, which you will come to see in a future post! Stay turned for more about my Kingston Penn trip! Places I want to travel to. 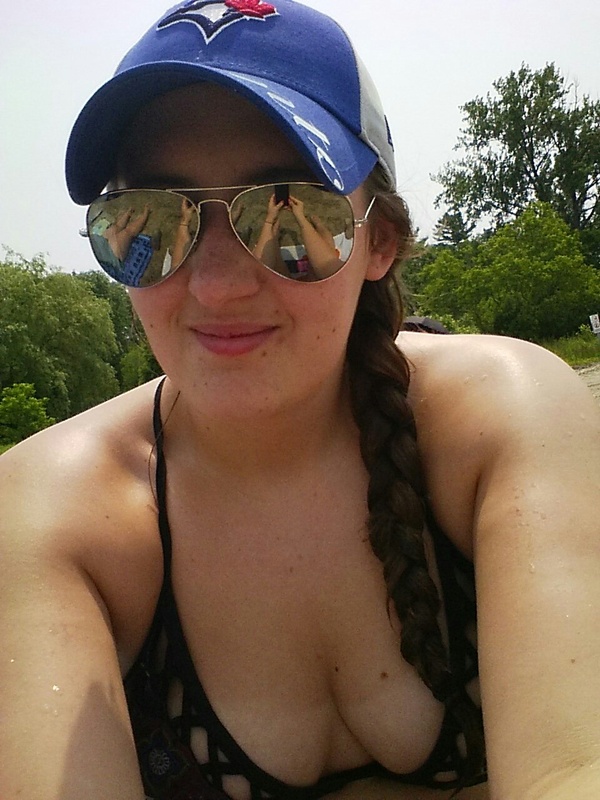 Places I’ve been in Ontario.